THE MONARCH CENTER for Women’s Leadership Development announces that its signature workshop, The Women’s Leadership Journey, will be offered in a telecourse format beginning May 1, 2012. The eighteen-week series of one-hour teleclasses that includes three-months of group coaching is a unique offering in woman’s leadership development. Women with busy schedules will appreciate this flexible alternative to onsite workshops. The Center’s new format gives women the opportunity to develop skills through extended collaborative work with the master instructor and fellow participants. The group interaction via teleclasses and coaching syncs with women’s preferences for collaboration and keeps them on track in achieving their leadership potential. “Thousands of dollars are misspent on workshops each year,” says Monarch Center founder, Merida Johns, Ph.D. “Most people complete a workshop but fail to take action on what they have learned. A principal reason for this is that workshops are usually one-time events that don’t allow participants to be guided in building and executing their skills over time. Our aim is to correct this drawback with this new delivery format,” adds Johns. The Monarch Center offers dynamic and innovative educational offerings, personal coaching and a collaborative learning community to help women and companies face current gender-based challenges that may be a significant barrier in women’s leadership advancement. The Monarch Center operates on the belief that gender diversity is good for women, good for business and good for the world. 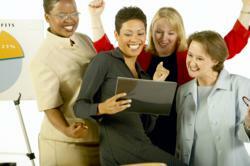 The next Women’s Leadership Journey begins May 1, 2012 and seats are limited.